"The submissions are truly inspirational stories," said Ken McDonald, TeamSnap chief growth officer. "They're just a fraction of the heartwarming kindness we see in the youth sports community everyday, which is part of why we're thankful to be a part of this community." 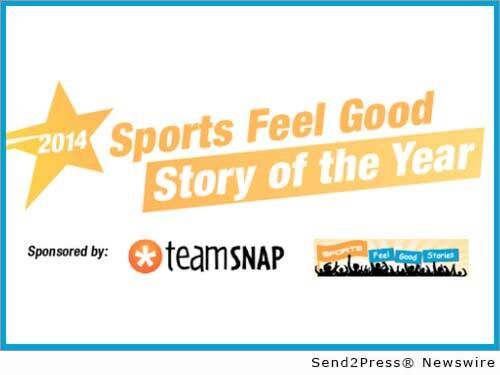 BOULDER, Colo., Nov. 12, 2014 (SEND2PRESS NEWSWIRE) — Voting is now open for the “Sports Feel Good Story of the Year” contest, sponsored by TeamSnap and SportsFeelGoodStories.com. The contest recognizes inspiring athletes, coaches and fans from around the world. Voting ends Nov. 30, 2014, and winners will be announced in December. From the pool of entries, five Sports Feel Good Stories were chosen as finalists. The public voting at http://www.sportsfeelgoodstories.com/contest/ will end Nov. 30, 2014 and will determine the first, second and third place stories. The first place winner will receive a $500 cash prize. * Orioles fan tells why it’s hard to hate the Royals. SportsFeelGoodStories.com showcases inspirational sports stories that focus on good deeds, overcoming obstacles and sportsmanship. Original Keywords: team sports, Feel Good, Stories, Mike O’Halloran, Ken McDonald, sportsmanship TeamSnap Boulder Colorado BOULDER, Colo.
REFERENCES: Boulder Business News, team sports, Feel Good, Stories, Mike O'Halloran, Ken McDonald, sportsmanship TeamSnap Boulder Colorado BOULDER, Colo.